One of the test projects in the Box2d for Delphi Firemonkey physics engine is a simple side view car simulation. Box2d for Delphi Firemonkey runs in Delphi XE5 and Delphi XE6 on Android, IOS, Windows, and OSX. The simulation has all kinds of different physics objects implemented in it including a ground plane with hills and ditches, a bridge, a couple jumps, and boxes to drive though. The vehicle consists of a body with two wheels. There is a Box2d for AS3 tutorial which shows how to create the car using Box2d objects from scratch. If you want to add motors and shocks to the vehicle there is a second tutorial in AS3 that shows you how to do that. AS3 can be easily translated to Object Pascal. 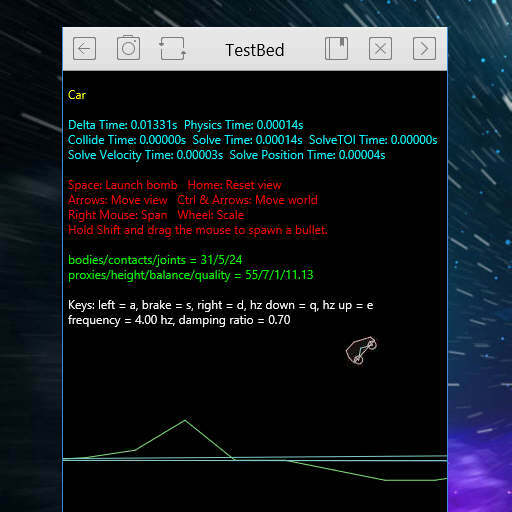 This car test project could be used as the basis for creating a game for Android or IOS or any number of other simulation uses. You could easily modify this sample to have the camera keep the car at the center of the screen and then load multiple levels with different ground configurations. Download Box2d For Delphi Firemonkey and start modifying the Car test project to suit your needs.